Health There are 3 products. 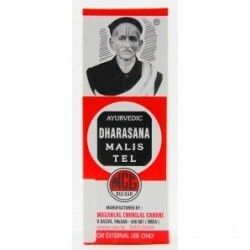 Massaging with Dharasana Ayurvedic treatment oil can give you prompt relief from ailments such as: Arthritis and joint pain, sciatica, back pain, swelling of the knees, overlapping of veins, knee pain, numbing of limbs, hands or feet, shooting pain, pain due to cold and more. 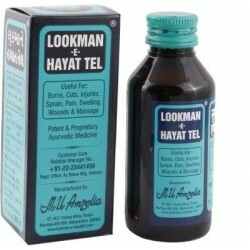 Lookman-E-Hayat tel is a product of a company called M.U.Amrelia. It is a massage and treatment oil for burns, burn marks, cuts, strains, injuries, pain swelling, wounds and other physical ailments. Rose Water/ Arq-e-Gulab Drops are useful to reduce irritation, redness and inflammation of the eyes. A few drops of rose water also be used as skincare for a youthful, radiant appearance. THIS ITEM IS OUTCODED. BB 01/19.